When it came to upgrading an old stone-walled building to the Enerphit standard — with all the inherent challenges such an upgrade poses for energy, airtightness and moisture — who better to have as your client and defacto site manager than a professor of physics? If you move to an architectural conservation area but want to extensively renovate an existing house, this can be a tricky task — especially if you plan on retrofitting it to the passive house-based Enerphit standard. This was the main challenge that faced Peter Blood and his wife when they chose to buy Rectory Cottage, a three-bedroomed cottage nestled deep within the environs of the glorious Brecon Beacons National Park in South Wales. The recently retired couple, who had been living in South Wales for over 20 years, had made the decision to look for a home within, or on the edge of, a rural community. They also wanted a new build, low-energy home — but two years of searching failed to turn up a plot in a suitable location. However, a chance meeting with local architect Patrick Thomas — who was selling a plot that they looked at but later rejected — was all it took to re-orient their plans in a completely different direction. 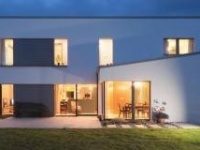 Although Peter Blood was familiar with the passive house standard for new build, Patrick Thomas introduced him to the Enerphit standard for refurbished properties. The couple quickly converted to the concept, and started to look for a suitable property to renovate. Rectory Cottage was originally a small stone-walled building that had been extended twice, but it was in need of some renovation and a re-modelling of the interior to make more effective use of the space. It also came with a former stable that served as a garage and garden shed. Patrick Thomas proceeded to draw up an imaginative remodelling for the house and brought in passive house designer Alan Clarke to advise. But Patrick later had to withdraw because of a clash with another project he was working on. So he drafted in his friend and fellow architect Simon Brown, who had also worked previously with Alan Clarke, ensuring the project stayed on track. The team looked at a number of properties, keeping the requirements of the Enerphit standard in mind, but Peter says that one factor in favour of the purchase of Rectory Cottage, along with its simple form-factor, was that it had a rendered rather than stone finish on the outside. This meant they could apply external wall insulation without changing the nature of the finish, thus keeping the planners happy. Sure enough, although they had to submit a number of amendments, it proved easier than expected to agree the scheme with the local planners, according to Simon Brown. “In essence, the planners considered the original building sufficiently unlovely to mean that almost any proposals would have been seen as an improvement. Therefore, we were pushing at an open door, and only had to adjust things slightly to take account of the conservation context,” he says. Beyond that, Simon Brown’s role was limited to detailing and advising as Peter, a physics professor, had the kind of knowledge not just to understand passive house principles, but to dig deep into the science behind the standard too. “My initial instinct to having a low energy house came about because of my scientific background. I think once I got going on it, I slowly got hooked on the methodology,” he says. However, Craig was a little wary of dealing with the technical detail — whereas Peter was very much in his comfort zone looking over spreadsheets of passive house data from Alan Clarke. So a working relationship quickly evolved between Alan, Peter and Craig that saw Peter become a kind of intermediary, conveying the technical information from Alan to Craig in layman’s terms. Peter was also on site whenever passive house specific work was being carried out. “It was kind of shifting some of the responsibility for ensuring the work was done up to the required standard onto me — but I was not unhappy with that because that meant, of course, I was in control,” Peter says. All of which meant that Peter slotted into the role of defacto site manager, although he is reluctant to claim a title like ‘project manager’ because he has no experience in the building trade or any formal management training. But as the client, he was in a good position to make decisions and authorise expenditure on the spot. Peter was also on site about three times a week, and in contact with Craig regularly by phone. (clockwise from top left) installation of 150mm of PIR insulation to the original ground floor; solar thermal panels on the upgraded roof supply domestic hot water for the renovated cottage; installation of the Plustherm graphite EPS external insulation system to the gable wall; Green Building Store Ultra tripleglazed timber windows set into the external insulation layer to prevent thermal bridging; the Ultra windows in place prior to the installation of the external insulation. Of course input from Alan Clarke and Simon Brown remained crucial, while Craig’s competence meant that no sub-contractors were needed for any of the passive house specific work. In fact, the only skill Craig didn’t already have was the airtightness taping of windows, which he quickly learned. Peter also attended the one-day construction module of the passive house designer course. ”I became aware that success in achieving certification required a fanatical attention to detail, and well beyond that usually given to a traditional building. I’m used to the meticulous attention to detail needed to conduct meaningful experiments in the lab, and that stood me in good stead,” he says. Of course, obtaining certification means a bit of extra cost. In this case the fees amounted to nearly £4,000, but the whole process also served as an independent audit of Alan’s design. “As part of the certification process, they scrutinise the calculations done by the consultant. And as part of that they made a number of helpful comments. So it functioned as a kind of independent check on the passive house aspects of the design,” Peter says. His wife also quite liked the idea of having a plaque on the wall, he quips. The remodelling of the house also included the construction of a link building to bridge the short three-four metre gap between the cottage and the stable, which now houses another ensuite bedroom and utility room as well as the two-car garage. But the stable building was not renovated to Enerphit standard, mainly because of the difficulty of preventing inevitable heat loss from a building with two garage doors, among other aspects. Some of the main cottage’s original stone walls were removed and rebuilt as part of the re-modelling, with the rest of the walls and cavity block extensions externally insulated with Plustherm 200mm graphite EPS with a K-Rend finish, though not before the cavity walls were filled with Walltite foam insulation. The original external render provided the airtightness layer for the walls, while there is an air barrier in the floor slab too, sealed to the internal plaster. The ground floor was excavated and insulated with 150mm of Ecotherm PIR insulation. The roof tiles were removed (and later replaced) to allow for the installation of an airtight vapour check on OSB with 100mm of Ecotherm on above the membrane and 90mm of Knauf Earthwool below. Meanwhile, a Paul Novus 300 MVHR unit fulfils ventilation duties, while heating is courtesy of a Worchester Bosch LPG boiler and integrated solar thermal panels, with the stable also hosting a solar PV array. The LPG boiler is the smallest capacity available, and is still set to a very low power output. Peter says a wood pellet boiler was considered “but they push out far too much power, too much energy” though he acknowledges they can be modulated. In the end it was the “inconvenience factor” that put him off it,” he says. 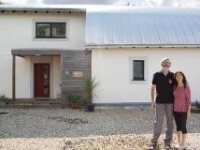 Alan Clarke is one of the UK’s foremost passive house experts, but says this was his first experience of using the component method of certification for Enerphit. This involves ensuring the individual components of the building fabric and ventilation system are certified, rather than aiming for an overall space heating demand figure. This method worked well at Rectory Cottage because of the poor orientation of the existing house, and because it also gave the team some leeway to allow thermal bridging at the stone wall footings. “Peter’s house is a good example since it had a blank gable wall to the south, and windows to east, west and north, so the net solar energy balance is not so favourable for a kWh per square metre calculation,” Alan Clarke says. The Bloods moved into the cottage last April and, while they are pleased with the finished house and happy that it meets their requirements, the litmus test will of course be its performance over the winter. 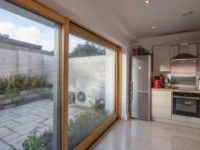 “From a passive house point of view I was initially surprised over the summer by the effect that passive energy inputs have on the internal temperature in a low-loss building, effects that were hardly apparent in our old house, like sunshine, cooking, people. But thinking about it, it’s what you’d expect,” Peter says. The project came within their budget, but Peter admits that it’s hard to tease out how much extra the Enerphit standard would have added to the overall cost given that the whole house needed a lot of work anyway. “But what I can say is that it wouldn’t have been worth going for Enerphit if we hadn’t needed to knock around the building in any case,” he says. Building type: Three-bedroom detached house, stone with block-work extensions. Treated floor area of 141 sqm. Location: Brecon Beacons National Park, Powys, Wales. Before: Pitched roof, tiles externally, no insulation, insulated plasterboard ceiling. New windows & doors: Green Building Store Ultra triple-glazed timber windows with insulated frames, overall U-value of 0.8 W/m2K. Green Building Store Performance timber entrance door with overall U-value of 0.1 Wm2K. After: Worcester Bosch Greenstar 12i (12kW) LPG boiler (supplied from 47kg cylinders), conventional radiators. Twin coil Greenstore cylinder, 2 x Greenskies solar thermal panels, ISM-1 interface with integrated FR110 controller. Ventilation: Paul Novus 300 MVHR. 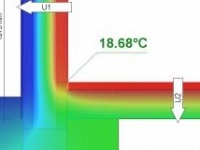 Passive House Institute certified heat recovery efficiency of 93%.